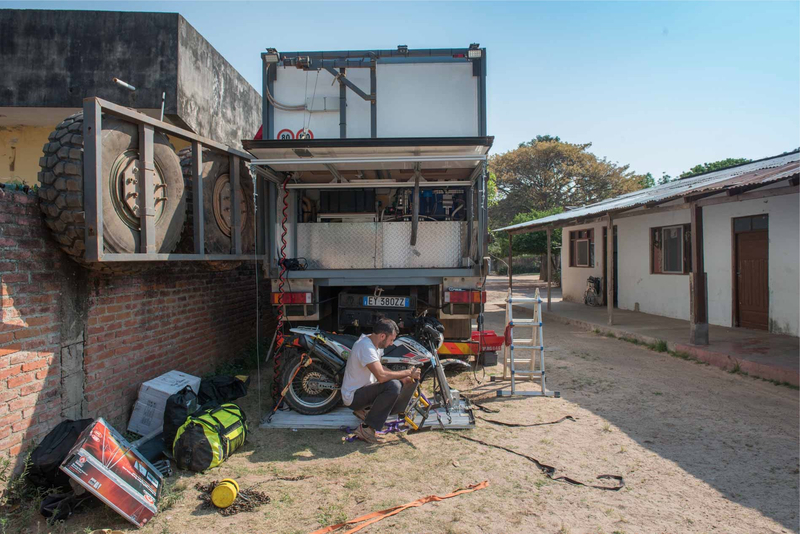 One of the questions that we are most often asked about during our trip is because we decided to face our life on the road with a 4×4 truck. 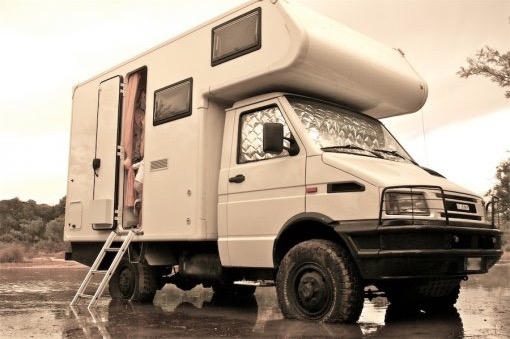 The doubt is like never an off-road, a van, or a normal caravan? To all those who ask this question we answer the same: there is no perfect vehicle, every means of transport has limits, the key to choosing the right one for your own needs is to find the compromise best suited to your goal, your habits , the destination of your trip and of course the budget available. That being said, what we want to try to describe in this article is what we learned during our travel experiences when, besides having tried our skin on the strengths and weaknesses of some vehicles, it has often happened to confront us with other travelers. What we struggled to understand right away, but that at the end of the counts seemed to us the most important lesson we have learned, is that not always the obvious choice is the best and certainly that every extreme does not bring benefits. The selection of the vehicle that will accompany you around the world will be made taking into account several factors that we will try to describe by differentiating various types of means of transport. Our tips refer to those who plan to make a long-term trip, or even start a new life on the road. The considerations of this article are not and may not be the same as we would do in choosing a short-haul vehicle. It is important to understand from now on that the daily budget for your life on the road will become one of the decisive components of your choice of vehicle. Be careful, however, that you do not make the gross mistake of assessing the daily cost of a vehicle simply on the basis of its consumption, in the reality of things the independence that guarantees a larger means often puts on the balance plate a considerable daily savings. This savings at the end of the month can make a thirsty more fuel efficient fuel than others whose full cost is less. What do we mean by independence? The more you get rid of the need to stay in paid areas because of the most trivial needs like showering, recharging batteries, or more simply to find some privacy, and the less you spend on a daily basis. The mistake might be to underestimate the theme by thinking that you will be able to find free places anywhere, the reality of things is that life on the road is more lived on the road than in exotic and heavenly places! The first choice: Off-Road Vehicle or Normal Road Car? Let’s start with the first diversification of vehicles that a traveler has at their disposal: means suited to riding on rough terrain or those that are less. Although it is true that you can almost go around the world without ever putting your wheels off the asphalt, it’s also true that on a journey around the world you will almost certainly have to travel through the streets as little as possible. Banally, there are countries where only the main roads are asphalted, while the secondary ones are almost always on the ground. In these same countries it is also likely that paved roads are in bad conditions, with continuous work and therefore potentially damaging for vehicles that are unlikely to be stressed. It is also important to consider that there are tourist destinations that are not always accessible on asphalt: parks, mountains, desert and rural areas are just a few examples. Reaching certain targets sometimes require roads to land. 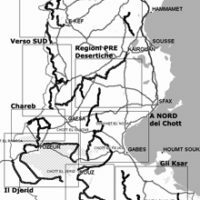 Lastly, there is a tendency to abandon the main roads, for example, we hate it, and in most cases we find ourselves in poor or unpaved roads. Our advice is therefore: even if you do not love and do not look for dirt roads do not think that during your life on the road you will not be able to go there. Moreover, as far as the world is concerned, the worst roads are being trampled daily by locals with normal utility cars. Do not think that sooner or later they will not be damaged. Any vehicle can go anywhere, but you have to see how and how long it will be able to do it before it breaks. 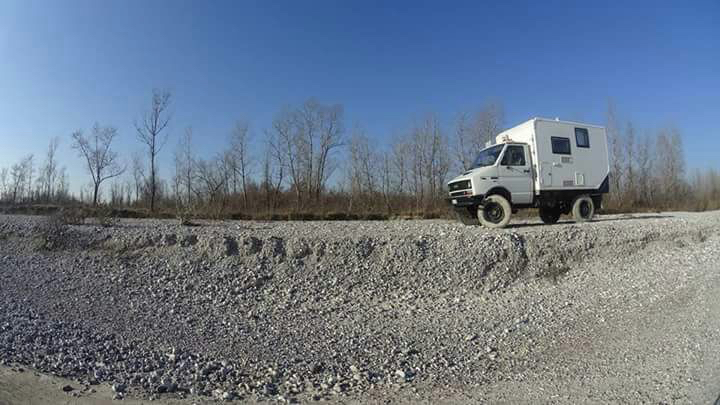 Remember that your vehicle will travel loads, better, then start thinking about a vehicle designed for off-road vehicle due to its higher ground clearance, or almost certainly for the greater robustness of some components. True problems begin now, when you have to think about what shape you will need to have your own new four-wheeler house. At this stage of the game, several decisive factors come into play, first of all the length of the journey. 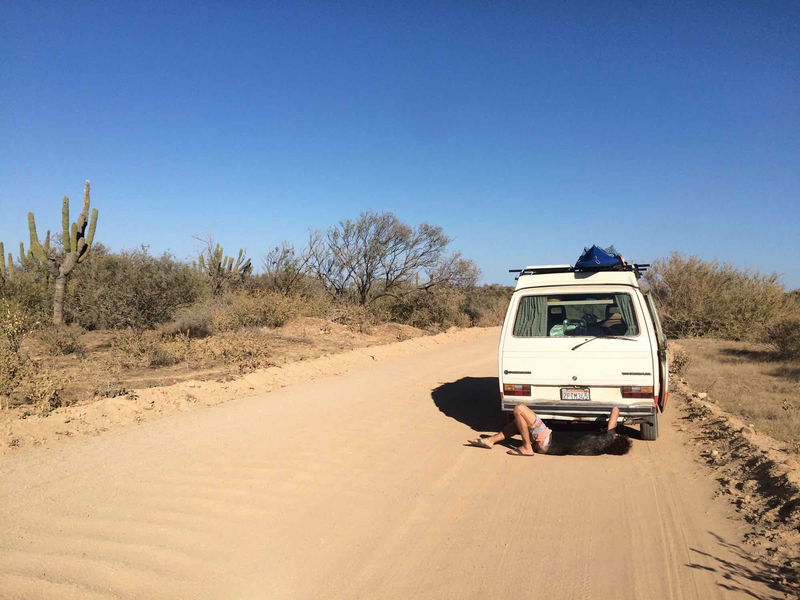 Choosing who is about to go on a one to two or three-year trip is driven by different needs than those who are not setting time limits or even those who are about to start a life on the road. Considering the daily budget, given its revenue or sweaty savings, the choice will be driven by a balance between vehicle management costs and those imposed by the daily life itself. What are we talking about? In addition to fuel consumption, it is important to be aware that life on the road is not so different from what you live at home. It serves water, a bath a good bed, a space to work or to relax when you are tired. There is a need to be able to shower after a day spent in the sun, or something not so far from reality, after fixing damage to your vehicle. It needs electricity to illuminate its spaces, to work on the computer, to charge your camera. A kitchen, a refrigerator is needed to preserve the food, so there is electricity or gas. Of course you will also have to think about your garments, the different seasons to the different climates between the mountains and the plains. Sooner or later you will have to do laundry, wash the dishes, drink water, and carry your supplies to the remote places. When it’s cold you have to warm the environment, the more your vehicle will be insulated and at least you will want to escape where you are. So when it’s hot, sleeping under a sheet of steel when at night is 35 degrees is not always enjoyable. Then? Our advice is to carefully consider all these aspects in order to correctly assess the cost of your daily life on the road. Let’s look at examples to better clarify this important concept. 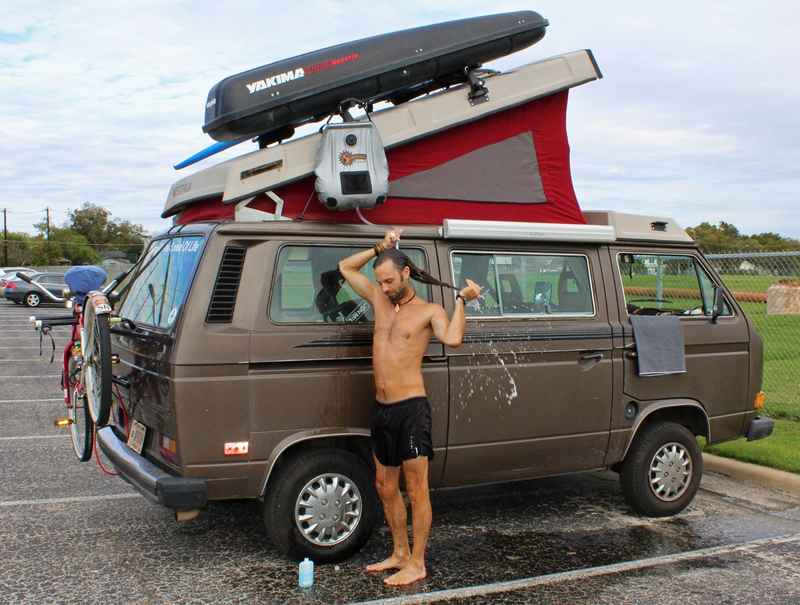 Vehicles such as the small van and the car set up with roof tents do not normally have an indoor shower and usually have a small water reservoir. In places where it is hot and where it is relatively isolated it is easy to think of an outside shower, but where it is colder? And when are you in town? Here, for a shower you will have to use the bathrooms of a service station, camping or hotel. This often entails additional costs that sometimes are high. Warning: Do not think that situations of this kind are limited in the past, in your life on the road you will find much more often than you think. Energy? It’s not always nice to use the Mc Donalds to charge your cell phone or camera, you can do it, we met people who used similar gadgets for months, but they all confirmed that only their temporary travel status gave him strength not to fall into the daily temptation to go camping or worse in a hotel. So even this is part of the budget, so choosing a vehicle with the right space to house energy sources like the solar eliminates or limits this budget item. So let’s go for order by listing those that we think are all kinds of defects and defects in order to help in the final choice. Very Important: Climates, unforeseen locations and situations should not restrict the use of their mobile home, as they should not affect the predetermined budget. Why this? 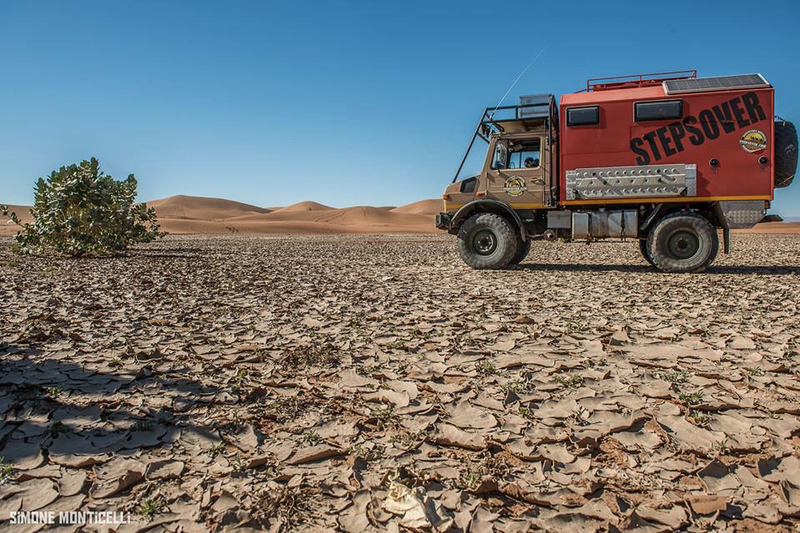 It is clear that you can live a month in the desert on an off-road vehicle with a roof tent, but it is not as true that you can do it in a city. In these cases find alternative or more comfortable solutions costs! 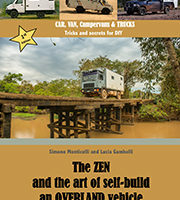 Needless to think of resisting the charm of a Landrover Defender set up for an Overland trip. When you start thinking about your vehicle this will probably be the first one to come to your mind. Of course of the same type there are others, such as Toyota, or the classic Mercedes Classe G. It is not our intention to evaluate which of these is the best, for now we limit ourselves to evaluating the spaces and consider them equivalent from the point of view of versatility, economy of operation and reliability. There are people who have lived for years in vehicles such as this, people of charisma and the propensity to the extreme journey that count by countless fingers of a hand. Some of these characters have adapted to a spartan life, while others have changed their way of doing things. In most cases a long-term journey on these vehicles without the provision of accommodation that gives access to more comfortable services is not for everyone. We include in this category both vehicles with Air-Camping or Maggiolina tents as well as those with awning and integrated tent. The substantial difference between the two is the greater privacy and convenience given by the sunroof that allows you to stand inside the vehicle and therefore experience more comfortable some situations where external access is limited or impossible. The profits of these vehicles are surely their versatility: from city to mountain track are practically unstoppable. 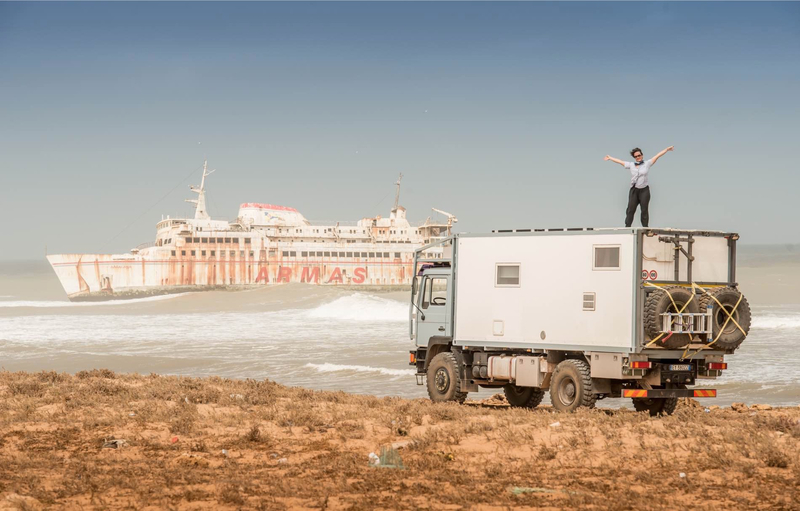 In contrast, limited space and low load capacity make them less independent so it forces owners to stop at camping sites, equipped areas and hotels in seldom less than three to four times a week. In terms of distance we consider an average of 10 km per liter of fuel that can drop in case of more powerful vehicles. An alternative to the Pure Offshore is the effective use of a living cell that offers the advantage of the tent version to provide greater comfort. The insulation of the walls and last but not least the particular interior design allows better optimization of the spaces dedicated to the services. From the point of view of versatility they lose slightly efficacy over the previous ones but only when the cell is disproportionate to the vehicle chassis. Be careful because cases like these are not as rare as you think. This type of solution offers the advantage of being safer when parking in urban areas, and the cell itself ensures a much higher level of privacy. The roof of the housing module can also accommodate solar panels, so even electrical efficiency takes advantage of it. 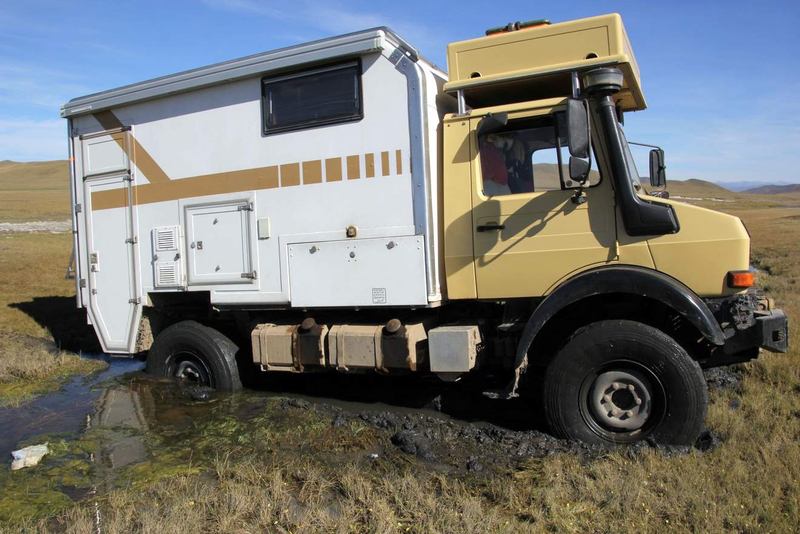 Of course, talking about pick-up or off-road housing opens up a vast world, but as far as we are concerned, we understand that it is best to use as a base for robust vehicles and small cells in order not to become the latter damaging to the vehicle itself. Let’s take the vehicle in the picture below, however apparently good, we think this cell is totally unsuitable for off-road trails. It is clear that the fuel consumption of these vehicles increases considerably, reaching an average of 7 to 9 kilometers per liter. Regarding our autonomy parameter, comparisons with travelers with these vehicles have led us to estimate that on average these stay about 3 times a week in paid places. 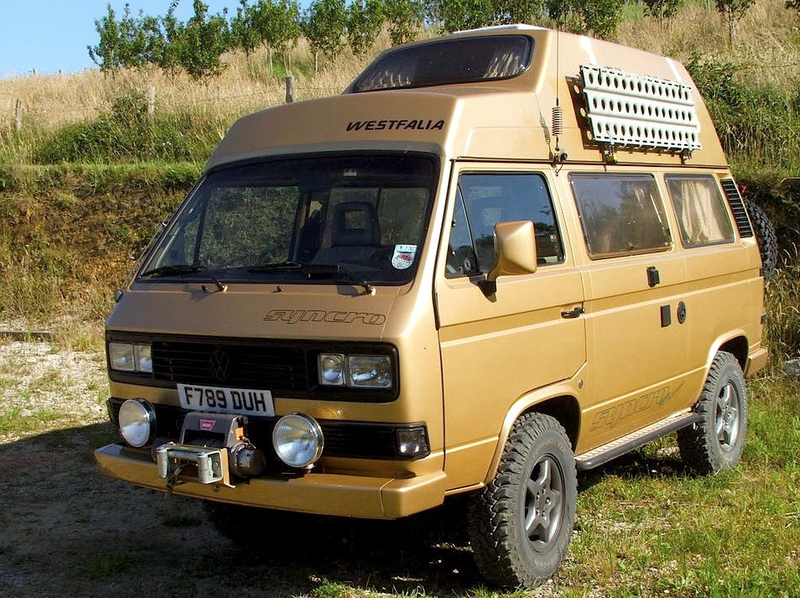 These are a particularly peculiar typology, there are not many such vehicles on the road but given their features they are well represented by the category of vehicles used for a Overland trip. This is the off-the-shelf version of the famous vans used by many Vanlifers, which are increasingly seen on the internet. 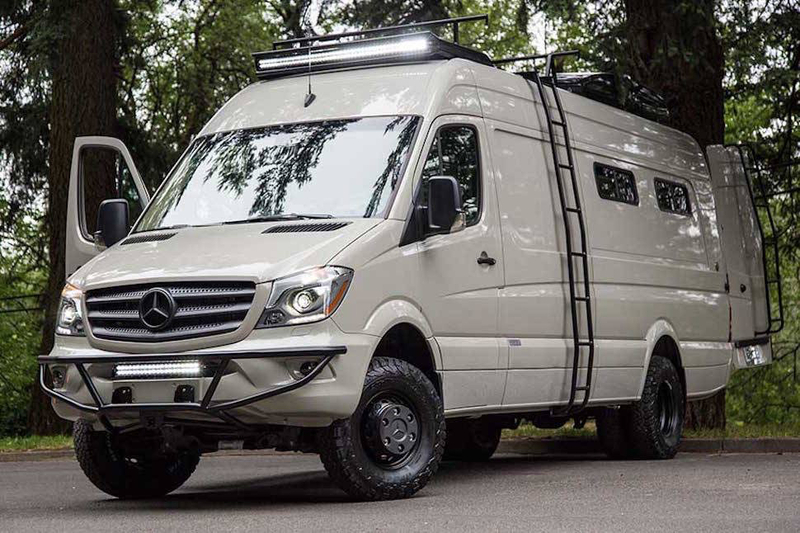 There are also two different types of vehicles, those with a high-roof “camper” and those that are more spartan with the roof-opening roof.The advantages of the more “camperized” version are remarkable, both in terms of privacy than in terms of viability. Both types suffer, however, from the problem of restricted spaces, as well as the lack of independence they give to their users. While it is normal to see beautiful photographs of fascinating pairs of young surfers who are spitting around the world on these media, it is also true that very few of them show the real aspect of the precariousness of those who live in a lifetime about these means . 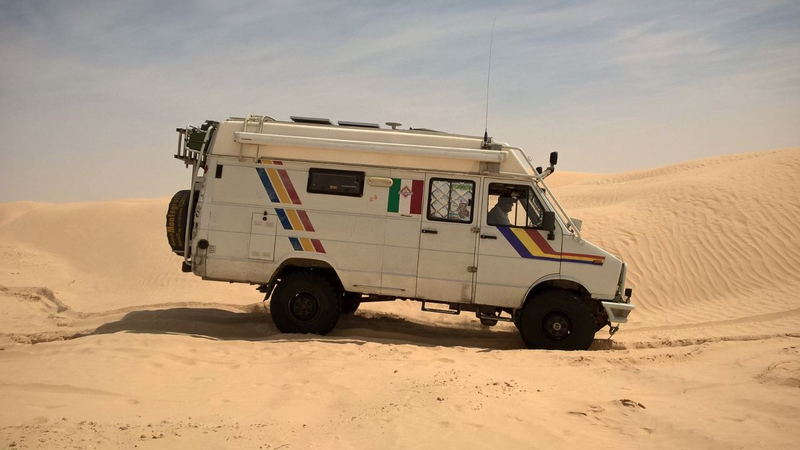 Last but not least, the distribution of these vehicles in the world is rather rare, and as a result of the difficulty of finding spare parts at remote locations, there is a problem of high cost of ownership. The issue of fuel consumption is equally interesting, as it turns out that these vehicles are a bit thirsty for their 4×2 versions. On average it is possible to estimate a distance of 10 km per liter of fuel. 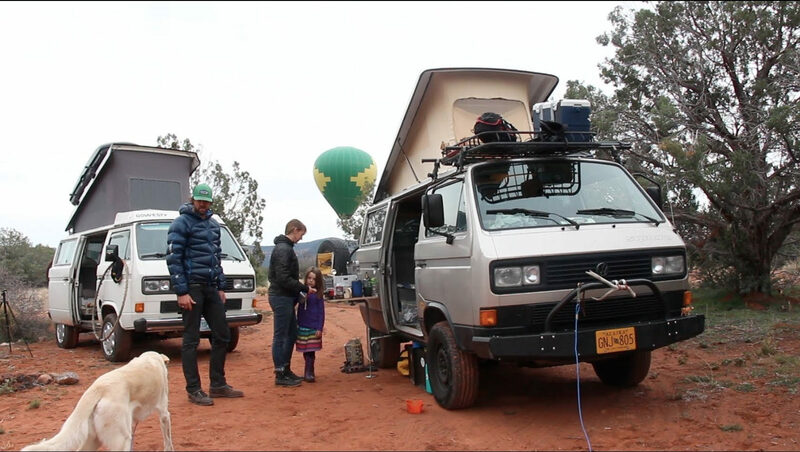 Traveling is inevitable to meet many VAN users who share the same spaces with the 4×4 version. The most commonly encountered problems are the lack of independence offered by the vehicle, which forces it to stop in paid areas. Also, there is almost everyone in the saying that living for long in hard-boiled places can become a drama. The cold has spared many Vanlifers from gorgeous places! Imposing a long-term journey on a vehicle of this type involves for example the ability to adapt to disadvantaged situations and to provide for a support budget at times of difficulty. As we said at the beginning, do not immediately think that discomfort will not be a problem for you: long-term discomfort to everyone. Let’s also mean these vehicles have some advantages, including the maneuverability they can drive everywhere. 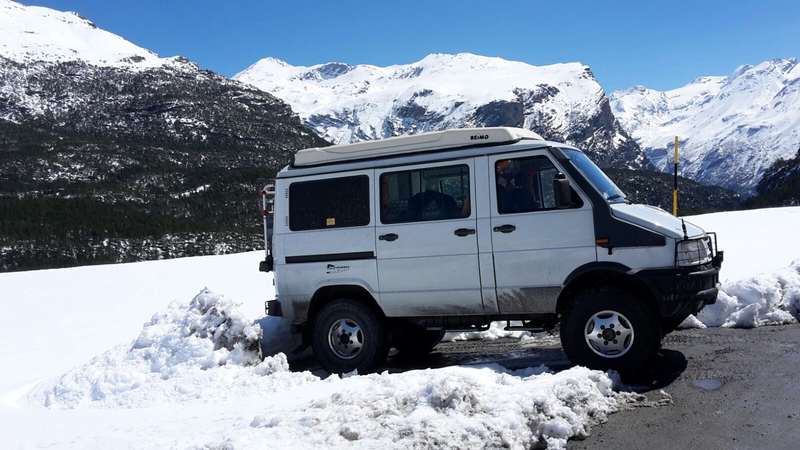 The van is the next step to VAN, basically born for cargo and freight transport has become a perfect base for setting up a vehicle suitable for Overland travel. 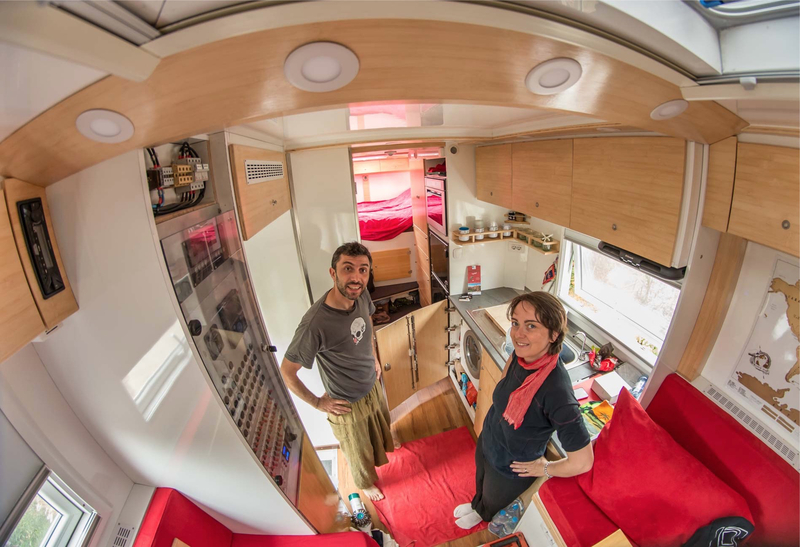 Compared to the VAN, it has a lot of available space, a higher load compartment height and therefore from our point of view starts to have sufficient characteristics of autonomy and adaptability to be seriously considered as a vehicle suitable for nomadic life. 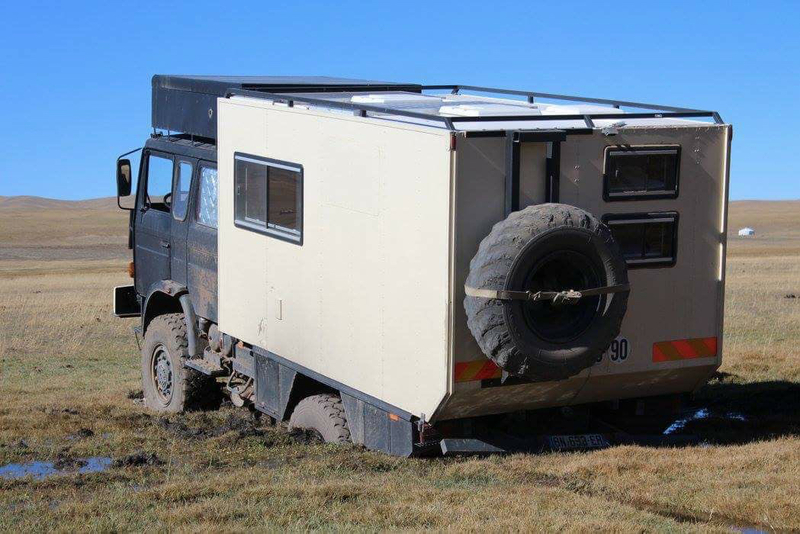 The pure 4×4 camper offers a good ability to adapt to the most critical situations for those who want to travel full time, as you have now realized they are not so much the difficulty of the trails, but rather the situations where you have to park in the city, in service areas or when you have no other alternative than spending the night on the roadside. The privacy and the space within it allow you to live without too much trouble some days inside, when, for example, bad weather, or when you have to stay for a whole day in some customs. These aspects should not be underestimated. 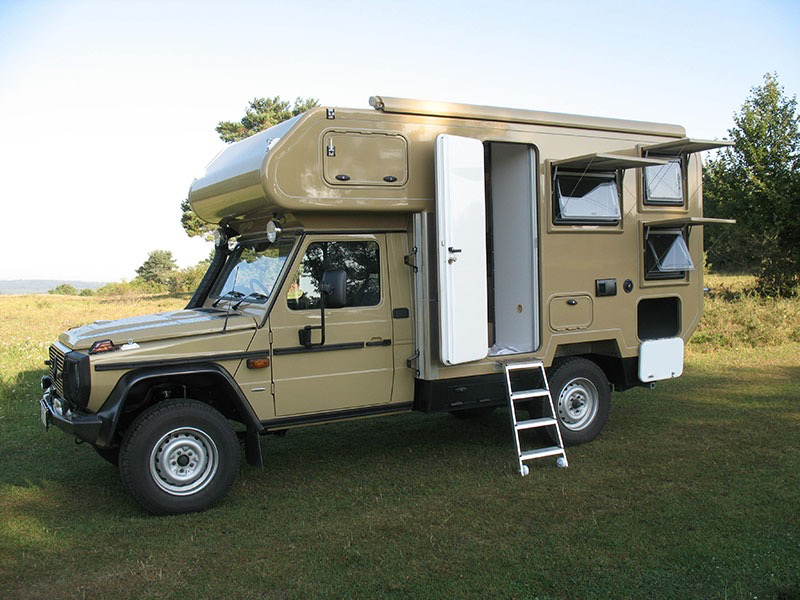 The characteristics of the pure camper considerably lower the need for its users to look for equipped areas. Naturally, the vehicle’s configuration, given the limited spaces, will have to be carefully studied to ensure that the needs of life on the road are met. For example, a van that does not have an inside shower is less suitable than the ones that come with it. From the point of view of the insulation, these means can be studied to ensure excellent performance, however, this is an aspect that depends largely on the type of outfit and the work that will be done after the choice. This is, however, a very important aspect that needs to be carefully studied in order not to limit the use of its medium in particularly difficult conditions from the climatic point of view. On the consumer side these vehicles may be somewhat thirsty, however, as we said, this aspect should be taken into account by putting in the final account also the advantages given by the fact that they allow for autonomy from paid areas. The average distance is 8 kilometers per liter in the street while off-road can range between 4 and 6 kilometers per liter. Thanks to the large roof and load capacity, these vehicles can be equipped with good solar systems, so energy autonomy can become discrete. However, these aspects are not always a priori, so if you want to purchase a vehicle already installed, you must pay particular attention. 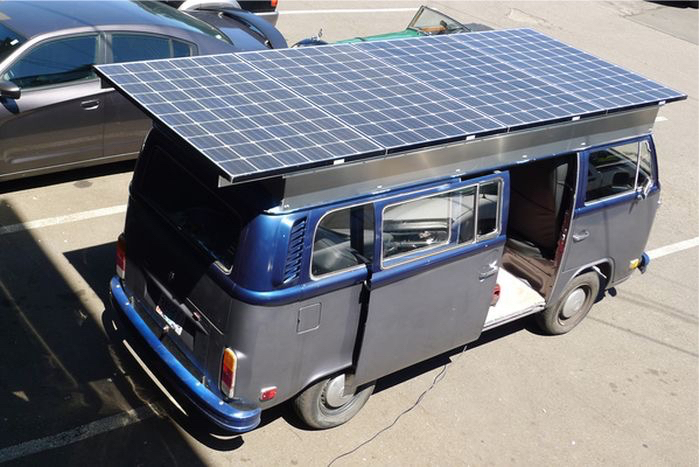 For example, a vehicle full of roof windows limits the possibility of installing solar panels, so many advantages will no longer be available. 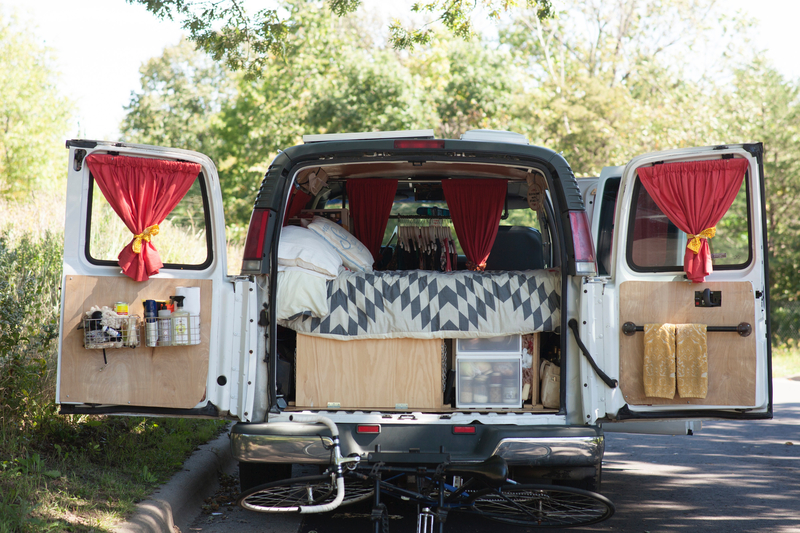 In short, the van offers some undeniable advantages, but it is not always easy to use them if the outfit is not properly designed. As a parameter of independence we can consider that the average need for these vehicles is about two or three stops per week in areas equipped according to the equipment. These are vehicles built on a chassis that is normally used for workmanship of different types, from the simple cargo box to the ambulance. Their versatility is undeniable, which is why they are one of the main foundations for the construction of vehicles that are faced with a long-term journey. 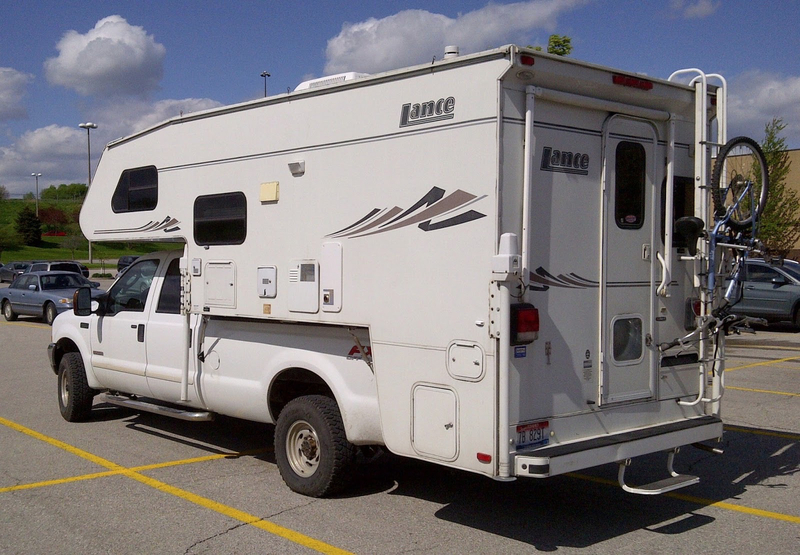 As with pure campers for these vehicles, the outfitting must be carefully studied, as the space still discreet does not allow much chance of error. Enjoying an insulated housing cell these vehicles offer the possibility to live in very different climates without too much trouble, while planning well the location of windows and equipment on the roof can achieve an excellent level of independence from the power grid. 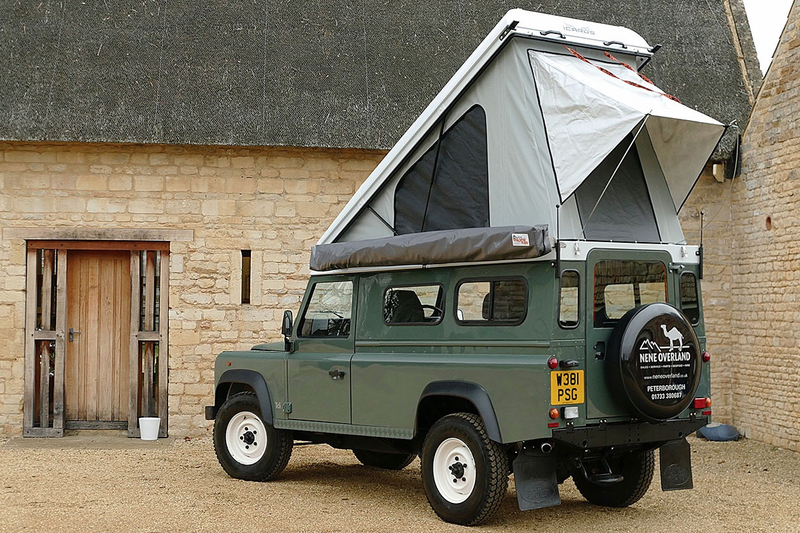 As with pure campers for these vehicles, the outfitting must be carefully studied, as the space still discreet does not allow much chance of error. Enjoying an insulated housing cell these vehicles offer the possibility to live in very different climates without too much trouble, while planning well the location of windows and equipment on the roof can achieve an excellent level of independence from the power grid…. At the construction level there is a wide choice and, as is the case for pure campers, there is also the possibility of sowing 3.5 tons of full load. For vehicles that exceed 3.5 tonnes, the same rules apply to trucks, hence the frequency of revisions and renewal of the driving license. These two aspects have to be taken into account during the vehicle selection phase, but we do not regard this as a real defect. Of course, under 3.5 tons of vehicles offer less load capacity and therefore their equipment will have to undergo substantial compromises. These compromises could undermine the degree of independence, so it is very important to make the right judgments. It is certain that this type of vehicle offers a high degree of versatility in urban use, despite the fact that size begins to be important remains easy to use in urban areas as well. The cellular structure allows safe stops in inhabited areas, service stations, or wherever you need to stop on critical occasions. Water reserves, if taken into consideration, can be considerable, especially in vehicles over 3.5 tonnes. From the point of view of consumption, the two versions can differ greatly, we talk about an average of 6 to 8 km per liter of fuel. Regarding the independence from paid and equipped areas these vehicles can be considered as pure colleagues in almost all cases, so potentially for them two or three stops a week depending on the set up. The Unimogs fall into the category of trucks, but from our point of view because of their particular construction they must be treated separately. Speaking of both 7,5 and 7-tonne full-load models, these vehicles rarely produce cells larger than 4200 mm without compromising the stability of the vehicle. 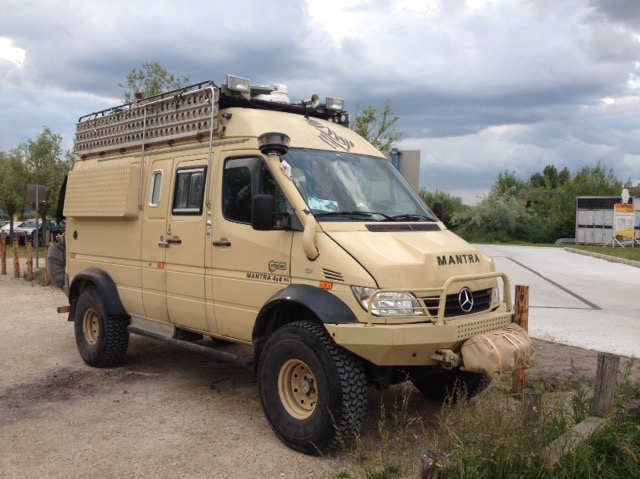 The most common version of Unimog has a pitch of 3250 mm that does not allow you to use cells longer than 3.5 meters. 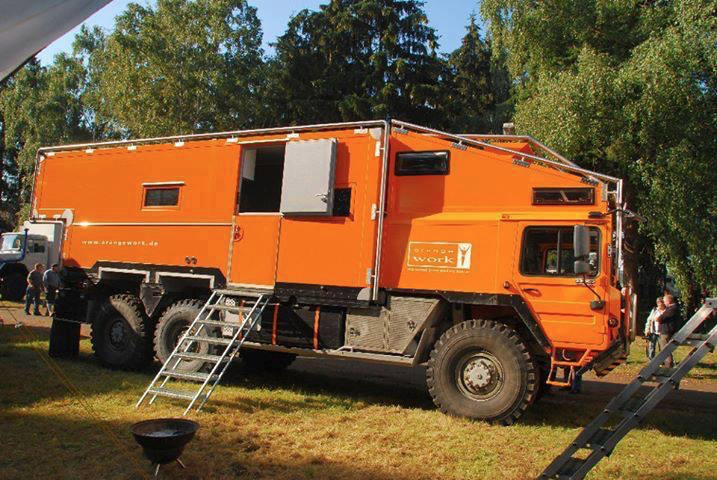 This means that the real benefits of a Unimog compared to a 4×4 camper are minimal unless they allow greater load capacity than 3.5 tons of vehicles. 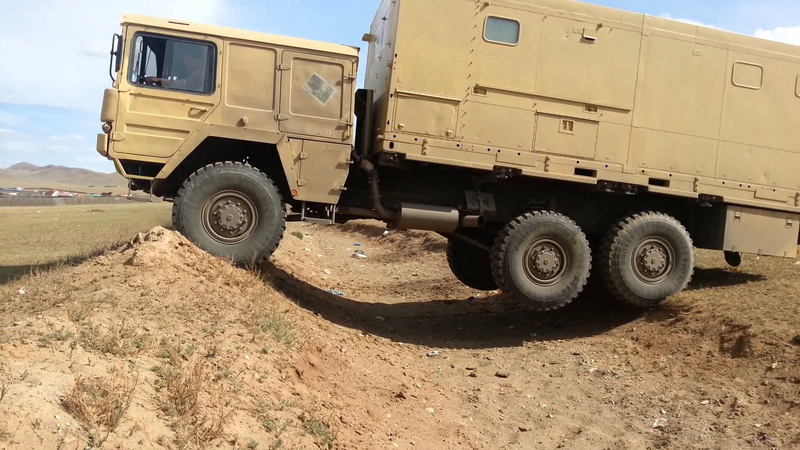 The Unimogs are the means of absolute technological quality, able to climb everywhere without apparently trying the least effort. These are robust machines, born to work for hours in underdeveloped conditions. This makes them unstoppable means for off-road trips, their robustness is a clear advantage over the vehicles handled so far, and the capillary Mercedes service network is a sure value added to keep in mind. Unlike most standard 4×4 trucks, however, 7.5-tonne Unimogs require more maintenance: frequent oil changes and level checks every 500 km. Oils are more expensive and of course also the quantities. 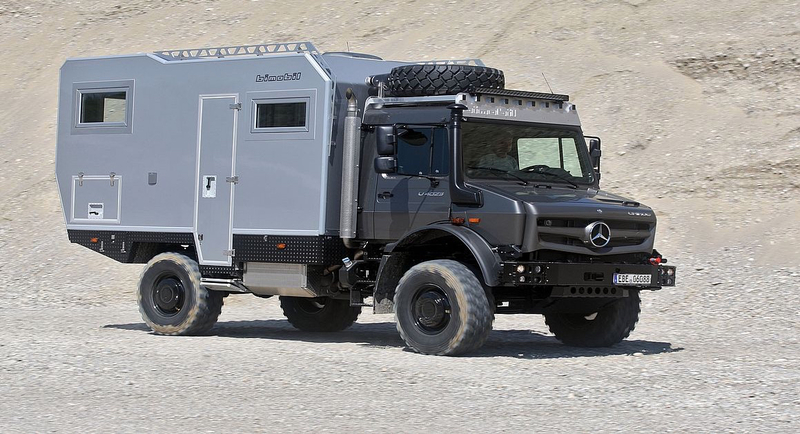 The Unimog chassis is specially constructed and on average it has a higher weight than that of its less extreme competitors (see next category). 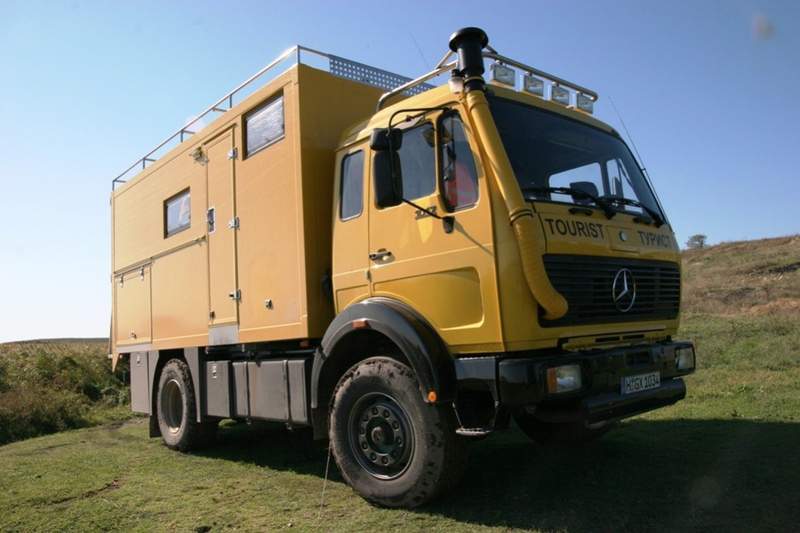 This means that a unimog with full load up to 7.5 tonnes has a seldom load capacity of more than 3 tonnes. This means that the cell and its fitting will have to be built with a minimum of attention to the weights. 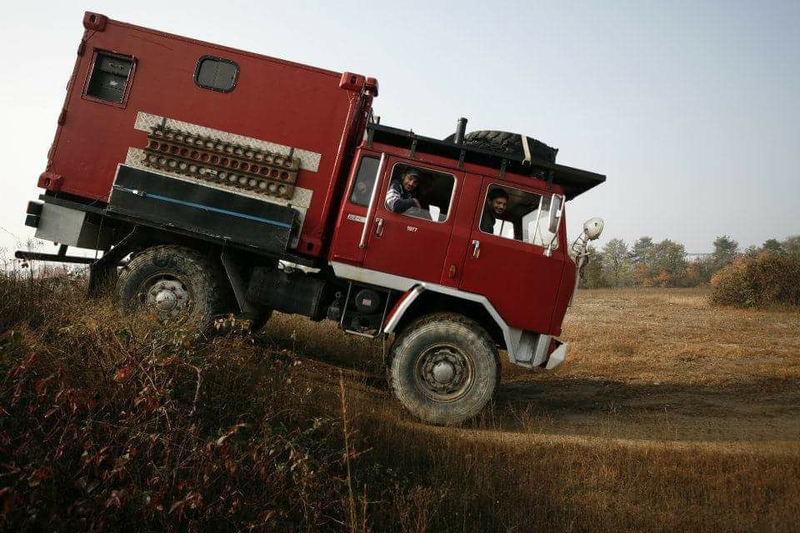 The unimog under 7.5 tons are not uncommon, but in fact they travel to 8. Excessively loaded vehicles have problems with instability and breakage of suspensions. Heavy-duty Unimogs, ie those that have over 7.5 tons, allow more space to load, require less maintenance in general, but of course they are much more expensive and rare in the used market. 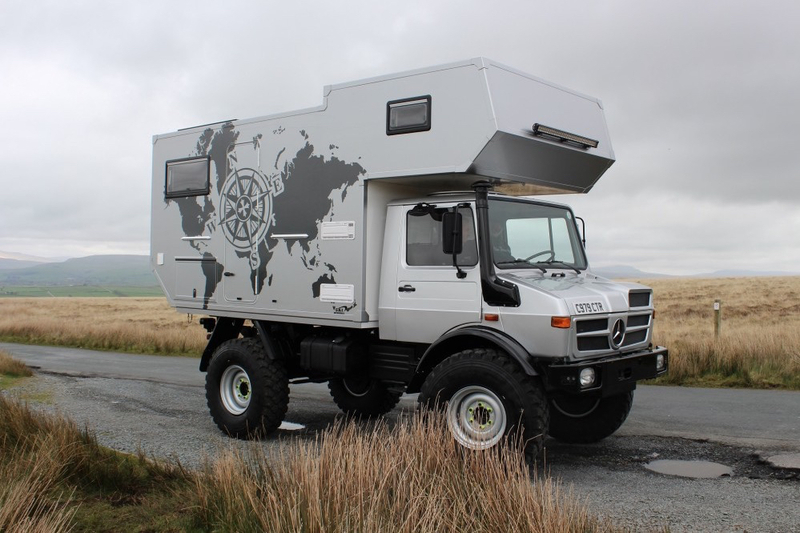 As much as we were enthusiastic about possessing a Unimog 1300L we think this type of vehicle is too disadvantageous in terms of daily budget for a long-term trip. 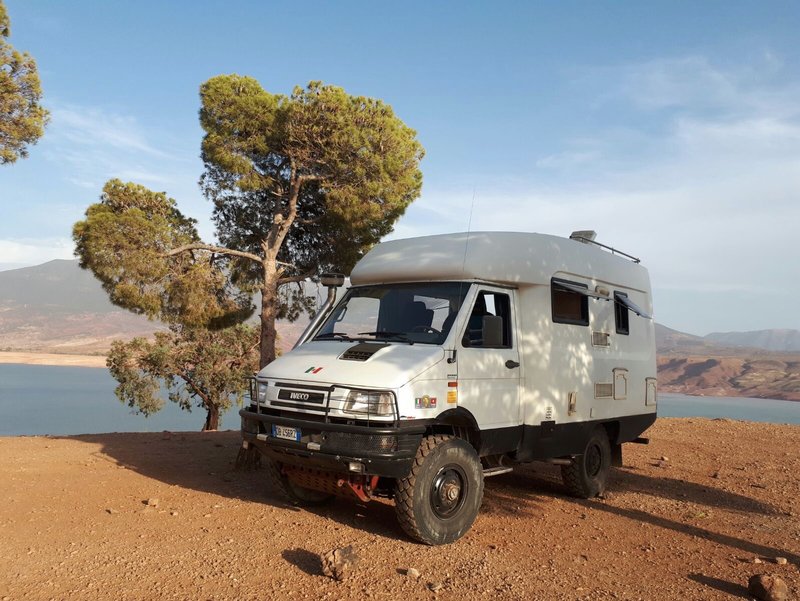 The reason is that although the off-road vehicle is an essential component, this is not the main ground on which it will go, the benefits that this vehicle brings to the 4×4 camper is therefore minimal. 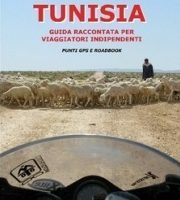 The difficulty of making it a totally independent vehicle from the equipped areas is the main problem. 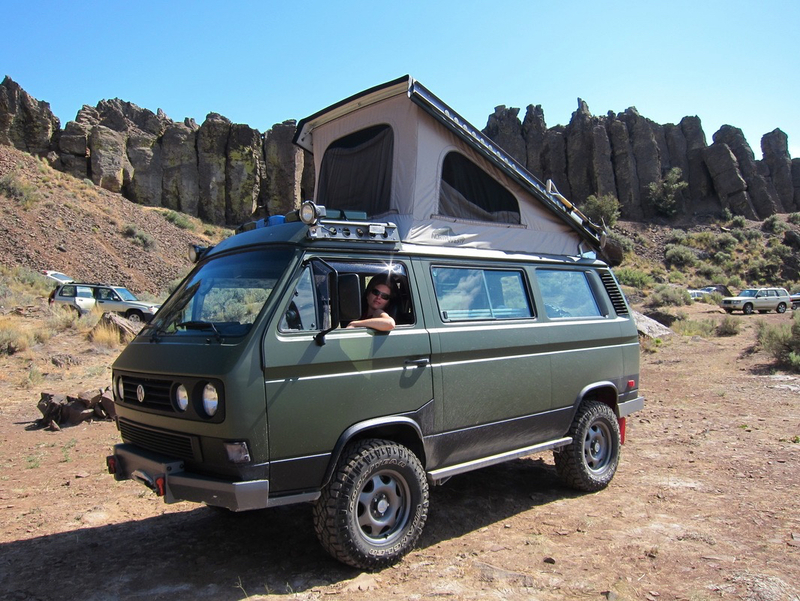 Its consumption is basically the same as a heavier and normally larger vehicle than a van, so it is not reasonable to think of it as a mobile home for a long-term life on the road. Caution: At least that budget does not allow it. The average distance of a Unimog 1300L is about 5 km per liter, which becomes 3 in the most demanding off-road vehicle. 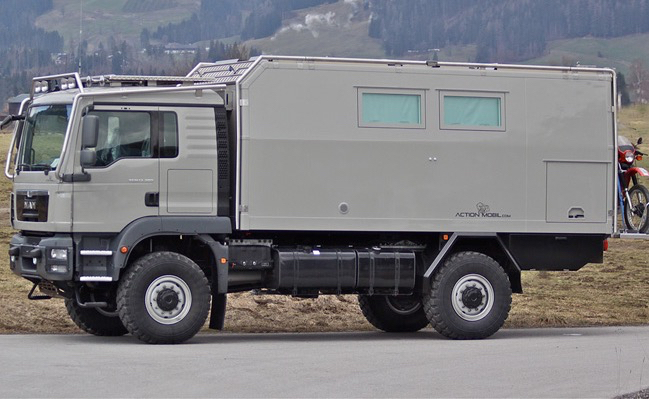 Indicatively, the owner of a Unimog will be looking for parking areas with a cadence similar to those of a 4×4 camper, so between 2 and 3 times a week. 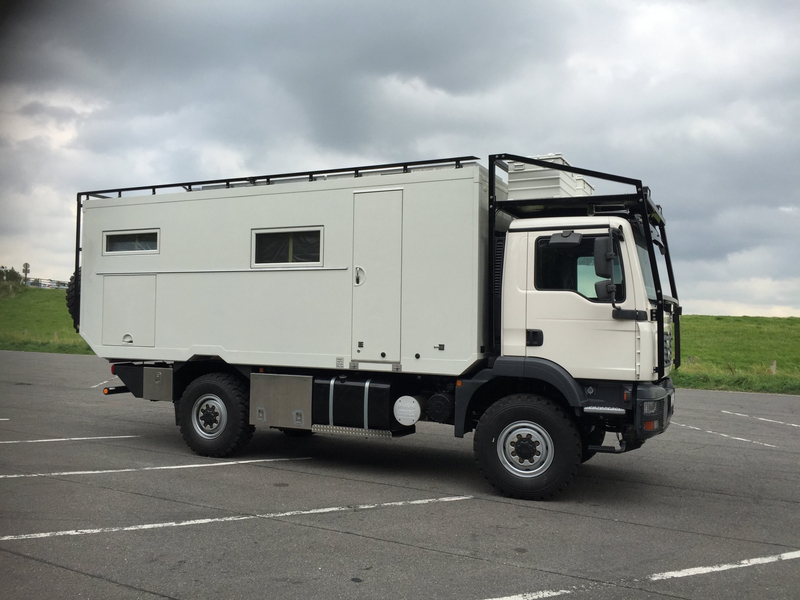 Moving from the category 4×4 vans or camper to that under 7.5 tons truck brings some benefits in terms of autonomy from the equipped areas. The vehicles in question Steyr, MAN or Mercedes that allow them to produce cells that can reach 5 meters in length, and this means a good margin for achieving a vehicle with a high degree of independence. 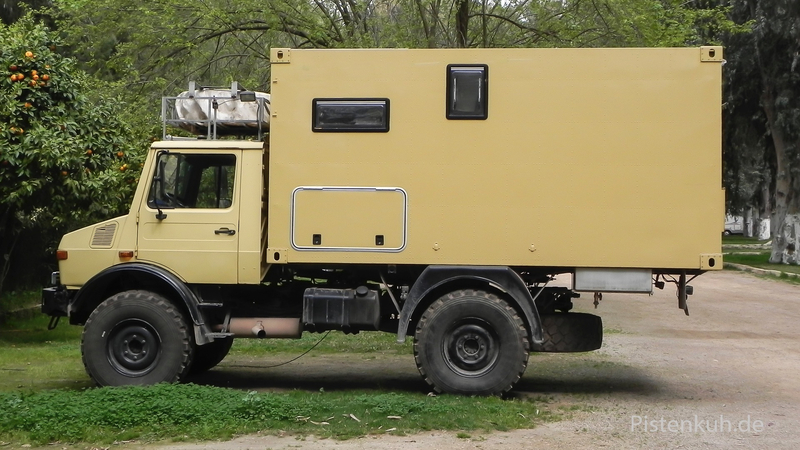 Unlike the Unimog these vehicles have a better ratio of frame weight to maximum capacity, as well as generally have all of the advanced cockpit. 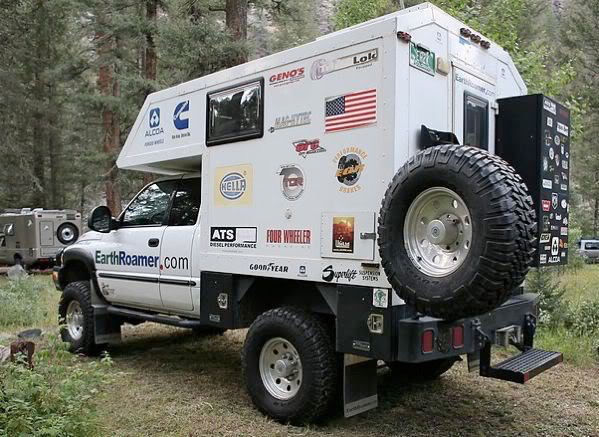 The Under 7.5 Tons truck category is one of the first to really make a nearly completely independent vehicle. 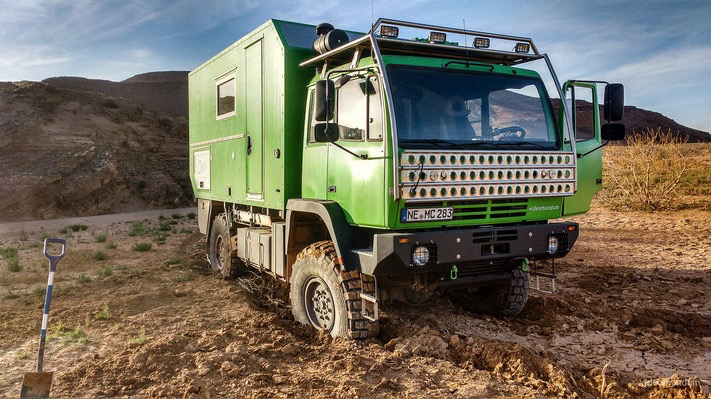 The fuel consumption of these vehicles allows on average to travel about 5 km with one liter of diesel while in the most challenging off-road vehicle consumption can safely doubled. 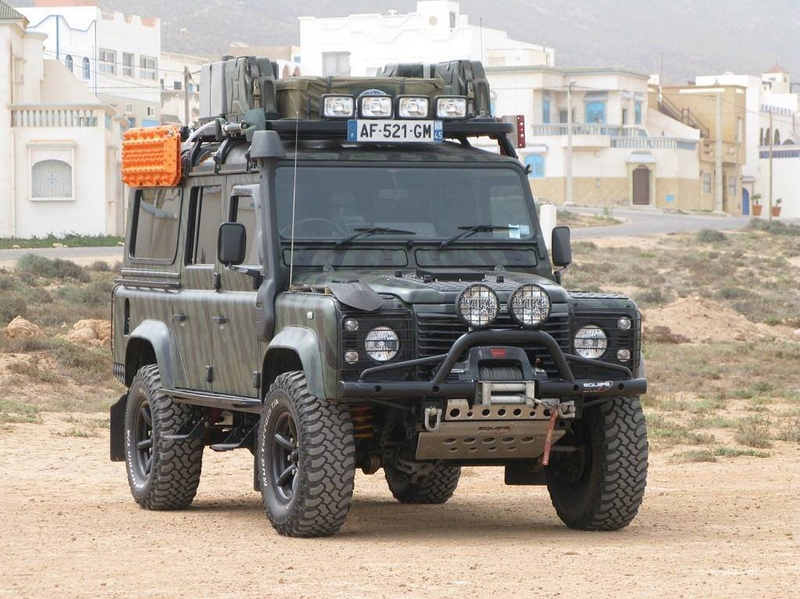 In terms of purchase costs, these vehicles can be particularly convenient due to the large market of ex-military vehicles. Above all, in Germany, there is the possibility of purchasing means that have traveled a few miles and above all in perfect condition of maintenance. 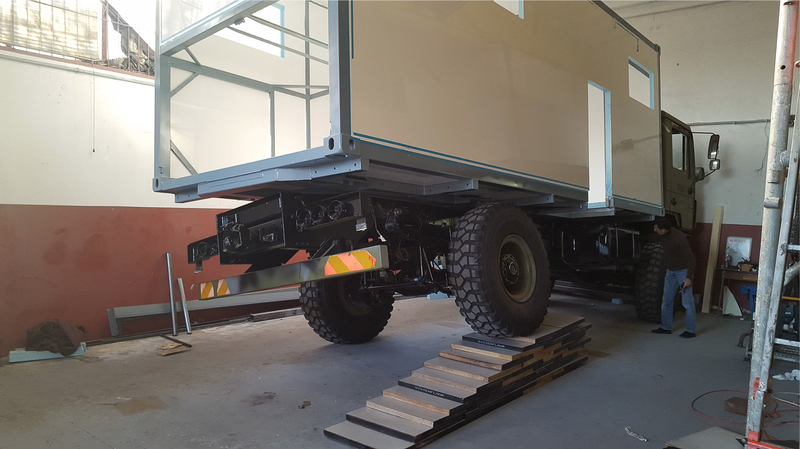 The construction of the cell of these means provides in most cases a three or four point chassis that completely disengages the housing module from the truck chassis. This is especially important as all truck frames are normally subject to flexion and therefore a rigidly fixed cell on this would be quickly compromised. This particular mode of fixing the cell entails significant construction costs that will of course be considered before purchasing. It should be noted that almost all military vehicles are already equipped with this type of frame, so a look at the used market is always very important. 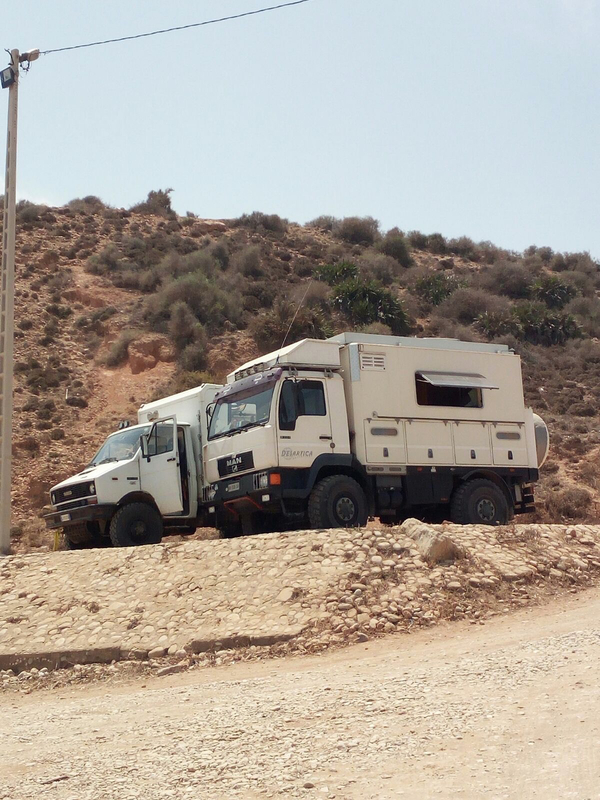 Naturally, these vehicles carry a number of defects, including mainly dimensions that do not allow them to spin freely in urban areas or in particularly narrow and unmanageable mountain tracks. It is undeniable that starting to think about this kind of vehicle you will have to put in the mental condition that you can not always reach every place. Another defect to be considered about these means is the type of tires they are equipped with. These tires are not always easy to find and their cost is considerably higher than that of regular work trucks. The total height of the vehicle can become a problem, as this rarely drops below 3.5 meters. The size of these means, unlike the sequences, rarely allows to hold a support medium (motion or quad) at least that this is not outwardly set, thus greatly compromising the posterior rush. This is the category where Valentino, our MAN 16.232 ex-Danish truck, comes in. This is the type of industrial means normally used in difficult work conditions and where an average load is required on average. This size of vehicle represents the ideal one to achieve a totally independent vehicle and compared to those of the lower weight category, which guarantees a higher level of comfort. For those who live on the road, comfort on board is not so much a question of luxury, it is more than the ability of your vehicle to not make life everyday stressful from a physical point of view. This is equally important in order to ensure a constant level of independence from paid areas. A vehicle of this category has an average mileage of 4.5 kilometers per liter of fuel, which makes it not too far from the vehicles of the lower category. Their load capacity and generous pitch allow you to set up a cell that can reach 6 meters in length. These dimensions are achieved without compromising the off-road exit angle and allow the creation of facilities and services that can lead to total independence. On the other hand, the disadvantages are related to the poor maneuverability of the vehicle in urban areas and where the roads do not provide adequate safety – or space – for heavy vehicles. The considerable height, generally between 3.5 and 3.8 meters, does not facilitate the transition to situations where only light traffic generally passes. The costs of building a cell for this type of vehicle are higher than those of other categories, in practice it is like building a larger home. The main cost is due to the fact that wanting to set up an autonomous cell is forced to adopt adequate equipment, but not providing the infrastructure vehicle to make it independent, we believe that this category of vehicles is of no benefit except that of being more spacious. Arranging all the necessary equipment and putting them into operation involves so much work on the part of professional craftsmen, so it is good to put everything in a budget before starting work. You have to be careful that this type of vehicle, whatever the brand, is not always available anywhere in the world. This means that spare parts are not always available anywhere. Just as for cars and vans, do not count on the fact that big brands are present in any market. In reality, things often have a local production rather than a limited import to certain types of vehicles that will easily be different from those available at your home. All this to say that spare parts can become a problem (ie this is true for any vehicle). This category of vehicles becomes particularly interesting when supported by a support medium such as a motorcycle or a small quad. These can become the economic means to expose places not too far away using the truck as a base camp. By using the vehicle this way it becomes possible to lower the total transport costs as well as any extra charges such as taxi or bus. Vehicles of this size allow to hold the support medium inside and this is a great advantage in terms of safety and indiscretion during the journey. There is another category of trucks, that of generally six-wheeled vehicles that bring a further benefit in terms of maximum capacity. On these vehicles it is generally possible to install a cell of over 6 meters in length. These powerful work trucks, often military vehicles or yardsticks, are naturally more expensive than all the previous ones in terms of day-to-day management. From the point of view of the benefits in terms of independence they have no advantage over the previous ones. The travel of such vehicles generally varies between 3 and 4 km per liter. From our point of view this type of vehicle could bring some benefits when the trip involves long stops. 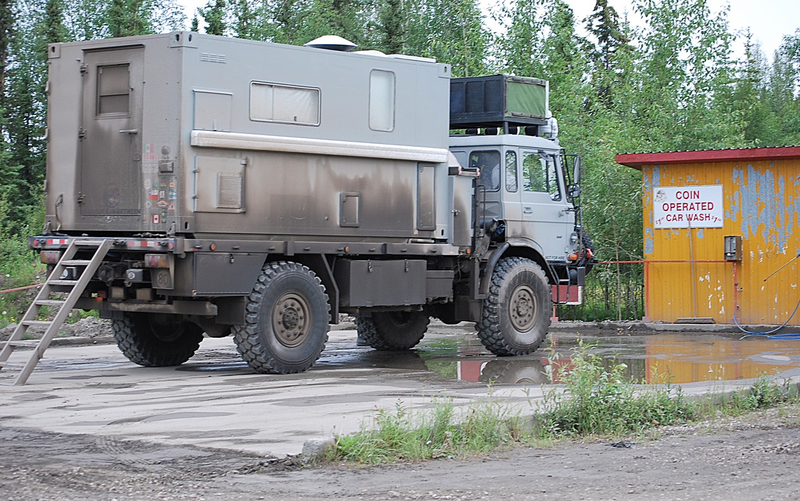 Taking advantage of the load capacity is easily imaginable to think of a support vehicle that can be used to explore the nearby low cost locations. Writing it may be trivial, but of course, such vehicles are absolutely limited in urban travel and especially on narrow streets and mountain slopes. There are trucks whose cockpit can accommodate more than three people; these are normally called double cabins. The space occupied by the same cabin is clear that it is a limitation for what remains of the living space. Double cab trucks are available in different steps (distance between the front and rear wheels) and it is evident that using them too narrowly leads to the lack of space for installing the services we deem necessary to make the vehicle independent. Of course, this type of vehicle is the only alternative (between trucks) when you travel to more than three people. From this point of view, always taking into consideration the purpose of our research, that is, the interest in dealing with a journey of several years in the same vehicle, we will have to think of means of the greatest possible potential. In terms of fuel consumption, these vehicles are entirely equivalent to those of the corresponding weight category. Of course you can make completely independent vehicles of this type are when these have really important dimensions. Hoping you did not generate any more doubts than you had before reading this artifacts, please write to us if you have any questions. 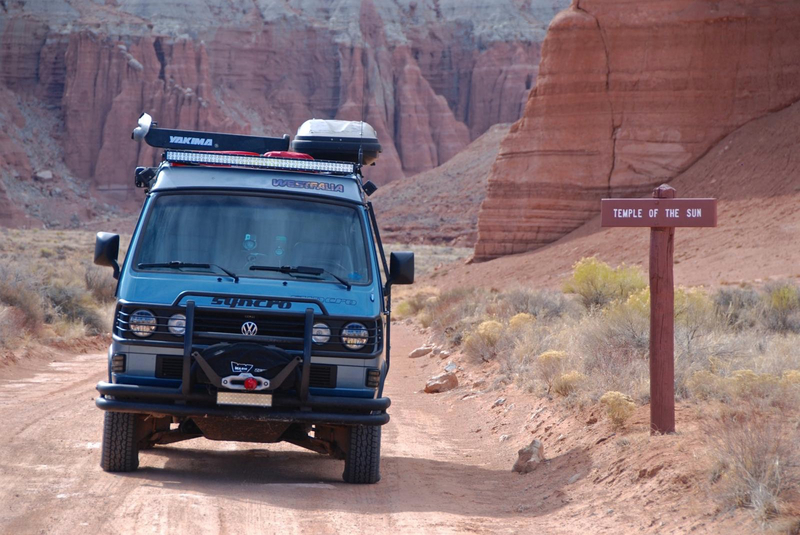 Finally, we like to remind you that the vehicle you are traveling with is not so important, but rather the motivations that motivate you to do so. 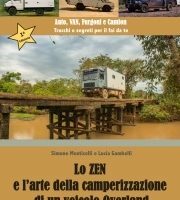 Thanks to Camper4x4.net friends for helping us write this article by providing us with some photos and data about the consumption of their media.